Miami, Florida-based Pollo Tropical will celebrate the opening of its newest Atlanta area location today in Woodstock. The new restaurant is located at 188 Molly Lane, just off Highway 92. As part of the grand opening, beginning at 9AM today, the restaurant will offer guests a chance to win "free chicken for a year," will provide the first 100 guests with a coupon for a free meal, and have a "charity challenge" to benefit local charities. Earlier this month, Pollo Tropical opened a new location on Buford Drive near the Mall of Georgia. Early next month, Pollo Tropical will celebrate the opening of their East Cobb location on Johnson Ferry Road at Parkaire Landing Shopping center. A new Dunkin' Donuts is preparing to open on Cobb Parkway in Marietta. The new freestanding donut shop is being built in front of the existing Northside Apartments, between Bojangles' and Tip Top Donuts, a local bakery. With the Walker School, Coca-Cola Enterprises and White Water not far away, hopefully there will be enough business for everyone. KnuckleUp Fitness plans to open a new gym in the former Rite Aid on Roswell Road in Sandy Springs. The property sits adjacent to the new "Gateway" project, closest to the CVS Pharmacy. The new 13,000 square foot gym is slated to open September 1st. Alex and Ani, a Cranston, Rhode Island-based jewelry retailer, plans to open their first Georgia location at Lenox Square in Buckhead. The new store will open on the mall's upper level in a space most recently occupied by Cache. Cache relocated to the upper level, from the lower level of the mall last year, but filed for bankruptcy earlier this year and closed soon after. A friend familiar with Alex and Ani described the brand as being similar to jewelry offerings from Free People. Free People, of course, has a store almost directly below the Alex and Ani store. Memphis, Tennessee-based Gus's World Famous Fried Chicken opened yesterday in the Mall at Peachtree Center on Peachtree Street in downtown Atlanta. The chain, which dates from 1953, has expanded to include eleven locations with another eight "coming soon" to the likes of Los Angeles, Fort Worth and Chicago, among other cities. The owners of Midtown's Sivas Mediterranean eatery plans to open a second concept. Close to double the size of the midtown restaurant, at 8,000 square feet, the new Sivas opened today in place of the recently shuttered Tilted Kilt on Barrett Parkway in Kennesaw. Sivas is owned by Kamal Karsli who before opening the first Sivas, operated its predecessor, Cafe Mezo, and before that, worked at Cafe Agora. Sivas offers traditional Mediterranean fare as well a hookah bar and lounge. Decatur's Cafe Istanbul, a similar establishment, also expanded to Kennesaw, opening on Wade Green Road in early 2011. Original plans called for the new restaurant to be a near replica of Sivas although new intel suggests the restaurant will be more like a traditional tavern. I'm originally from Rhode Island and everyone up there seems to be wearing the bangles that have round charms of uniform shape hanging from them. The founders are Armenian, as I am, and wearing a number of bangles is meant to mimic the sound of Armenian dancers. 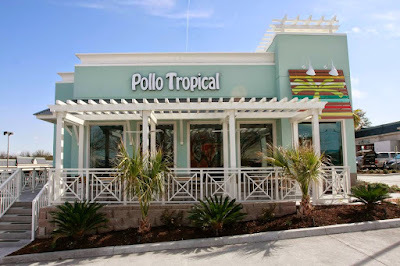 I heard that Pollo Tropical will be opening an outparcel location in the parking lot of Target at 285 and Lavista Rd. That is correct. More info can be found in this post from last month.